I’ve always enjoyed serving, and eating, lachmagine, a Syrian meat pizza mozze, or appetizer. With cauliflower crust pizza so popular these days, I was inspired to try a cauliflower crust lachmagine for Pesach. 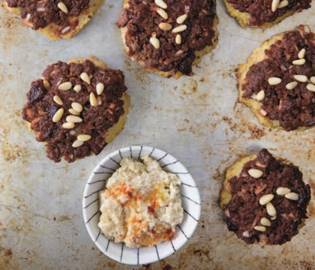 I debuted it at the VIP Ram Pesach program (where I run cooking classes), and the Sephardic guests gave this recipe a thumbs-up for authentic flavor! Prepare the crust: Shred the cauliflower in a food processor until it resembles small crumbs. Tightly wrap the cauliflower crumbs in a clean dish towel. (I divide the crumbs in half and use a separate dish towel for each half.) Squeeze the towel until the crumbs are dry. If the cauliflower is still cold from the freezer, let it sit out for 20 minutes and squeeze it again. The cauliflower should be very dry or the crust will become soggy. Place the dry crumbs into a bowl; add egg, salt, and spices. Mix really well until a “dough” forms. Preheat oven to 400°F. Line a baking pan with parchment paper; set aside. Form ¼-cup dough into a 2-3-inch round; place onto prepared pan. Repeat with remaining dough. Bake for 15 minutes, until they start to brown. Remove pan from the oven. Meanwhile, prepare the meat topping: add all topping ingredients to a large bowl, mixing well to combine. Reduce oven temperature to 350 degrees. Spread ¼-cup meat topping onto each baked round, pressing down so it sticks to the dough. Make sure to spread topping all the way to the edge, as the meat shrinks while it cooks. Sprinkle a few pine nuts on each if using. Bake until the meat is cooked through and browned, approximately 30 minutes. You can use store-bought pizza dough rounds in place of the cauliflower crust. Prepare recipe through Step 5, then freeze. Defrost, add the meat, and bake. For a dairy meal, make mini pizzas: Prepare the cauliflower crust through Step 5; add pizza sauce and cheese; bake in a preheated oven until cheese melts.